Gov. Dannel P. Malloy meets the press after Tom Foley concedes. Republican Tom Foley called Gov. 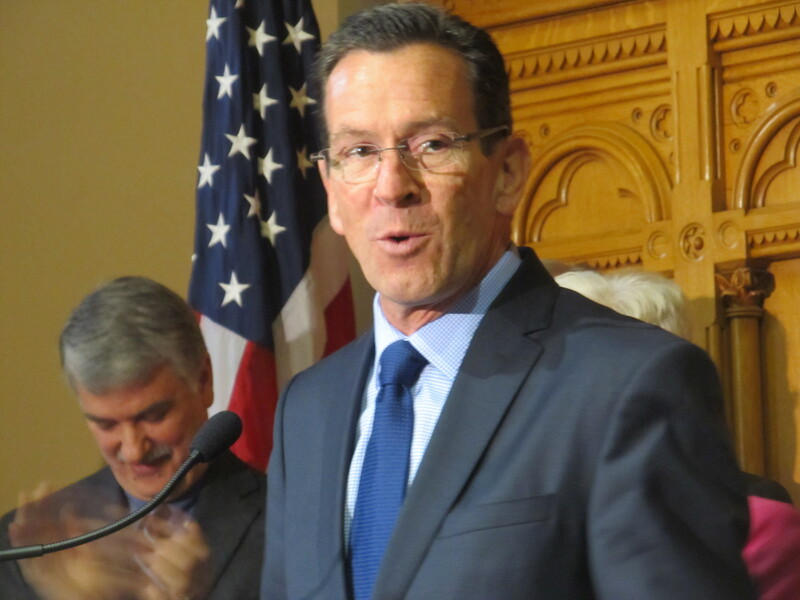 Dannel P. Malloy to concede defeat in Connecticut’s race for governor Wednesday afternoon, about 12 hours after the first-term Democratic incumbent declared victory. “He called me around 12:30 to say he had kicked the numbers around, and it was apparent I had won,” Malloy said in a post-election press conference at the State Capitol. Secretary of the State Denise Merrill said the entire Democratic ticket of statewide officers won re-election, all with sufficient victory margins to avoid a recount: Malloy, Lt. Gov. Nancy Wyman, Attorney General George Jepsen, Comptroller Kevin Lembo, Treasurer Denise Nappier and Merrill. Malloy beat Foley 547,273 to 519,925, giving him a plurality of 27,348 votes, quadruple his 6,404-vote victory over Foley in 2010. Petitioning candidate Joe Visconti, who suspended his campaign and endorsed Foley two days before the election, had 11,295 votes, about one percent. Jepsen, the first-term attorney general, was high voter-getter with 573,050 votes and a plurality of 153,301. Nappier had the closest race, winning by 15,245 votes. All 187 state legislative races also would be resolved without need for a recount, including two state Senate races that were too close to call Tuesday night, Merrill said. Malloy, 59, won with 51 percent of the vote, a significant milestone for a governor elected in a three-way race in 2010 with 49.5 percent of the vote. His highest job-approval rating in four years was 48 percent. The governor was asked if Foley was gracious in defeat. Malloy paused when asked if Foley congratulated him. “Uh, I think he did,” Malloy said. Malloy prevailed against a national Republican tide and four years of dismal polling, including surveys that found 52 percent of likely voters expressing an unfavorable opinion of the governor a week before election day. Malloy was in a light mood, deflecting most serious questions about his plans for the next four years. His new term begins Jan. 7, the same day that the General Assembly convenes with Democratic majorities in the House and Senate. He was asked if he might change his style. “I might wear more jeans,” Malloy said. Roy Occhiogrosso, the governor’s longtime political adviser, said Malloy was helped by a positive jobs report in October, his debate performances and a strong ground game by his campaign and labor.